My week in Burgundy started off with a resounding bang. Tasting the wines of Domaine Trapet is an experience to be savoured. I would have appreciated it all the more if I hadn’t gotten lost…an impressive feat considering that the winery is on the main street and I drove straight passed it before turning off to meander along the side streets. I was received my Madame Trapet (senior). There can be no greater positive publicity than having your mother pour your wines. With quiet pride and great dignity, Madame Trapet related the estate’s history finishing her tale with the feats of her talented son, Jean-Louis, and his equally skilled wife, Andrée. Domaine Trapet is an 18-hectare estate with impressive vineyard holdings in and around Gevrey-Chambertin; notably five Premier Cru sites, and three of the most sought after Grand Crus: Chapelle-Chambertin, Latricières-Chambertin, and the mighty Le Chambertin. Seven generations of the Trapet family have tended the estate’s Gevrey-Chambertin vineyards. In the 1920s, the Trapets had amassed one of the largest vineyard holdings on the Côte d’Or, but it wasn’t until the 1960s that the family began bottling their wines. In 1993, the winery – until then known as Domaine Louis Trapet – was divided to allow a new generation to go their separate ways. 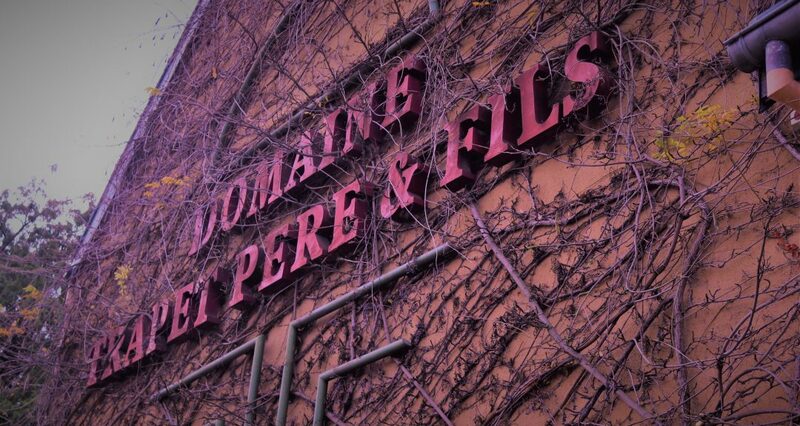 It was then that the estates of Domaine Rossignol-Trapet and Domaine Trapet Père & Fils emerged. It was also around this time that Jean-Louis Trapet, now at the helm of Domaine Trapet Père & Fils, decided to farm the estate according to biodynamic principles. Madame Trapet chuckled at this stage of the story, as she explained how the young Jean-Louis, fresh from his viticultural studies, announced the news to his father. “We had no idea what he was talking about” she said. It took some persuading, but Jean-Louis was adamant, and within a few growing seasons, the elder Trapets were convinced. The vineyards of Domaine Trapet are certified biodynamic. “We are so much more in tune with our vines since making the switch”. “We are so much more in tune with our vines since making the switch”, explained Madame Trapet. “They are healthier, hardier, and give far more expressive fruit”. The vineyards of Domaine Trapet now hold the Demeter biodynamic certification. Winemaking practices have also evolved dramatically over the past 25 years. Once known for its heavily extracted, lavishly oaked style, the wines of Domaine Trapet are now the epitome of Burgundian elegance, purity, and finesse. Vinfication techniques depend on the vintage but generally consist of a brief period of cold maceration, followed by fermentation in open top wood fermenters with partial inclusion of stems (30 to 50%). Maceration is long and slow, with delicate extraction via punch-down and then gentle pump-overs in the later stages. Regional and village wines see 20% new French oak over 12 months of ageing, while Premier and Grand Crus are matured 18 – 20 months in 35 – 50% new French oak. Sulphur is added only at bottling, in minute doses. Our tasting centred around barrel samples of the 2017 vintage. I was treated to another of Madame Trapet’s radiant smiles as she spoke of the 2017 harvest. “It was a summer marked by heat waves, and blessed with beneficial rains late August” she said. 2017 gave a desperately needed bumper crop to the grape growers of Burgundy. After a string of growing seasons ravaged by frost, hail, and wet weather, 2017 was a blessing. ‘The wines are really approachable with ripe, rounded tannins”. 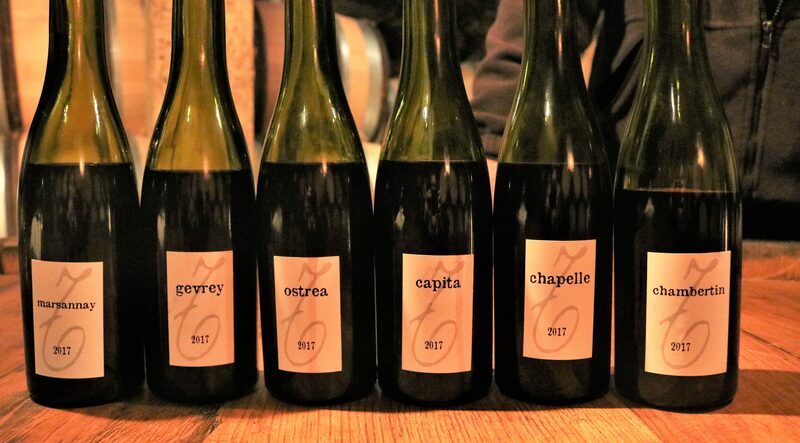 The wines of Domaine Trapet are the epitome of Burgundian elegance, purity, and finesse. After a brief, enjoyable chat with Jean and then Jean-Louis, we proceeded to taste. My notes below. Many thanks Madame Trapet for giving so generously of your time. Your exquisite wines could not have been poured for a more appreciative palate! Bright red currant, red cherry, and black plum aromas on the nose, underpinned by mossy, forest floor notes. Lovely tangy acidity on the medium weight palate, with moderate depth of juicy red and black berry flavours. Silky tannins frame the fresh, lifted finish. Very approachable. Wonderfully fragrant, spiced nose, initially showing lots of crushed raspberry, blackberry and cassis fruit. Earthy, cedar notes develop upon aeration. Quite brisk on the palate, medium in body, with a fairly firm structure giving way to surprisingly velvetty tannins and subtle oaked nuances. Hints of wet leaf and black berries linger on the finish. Ostrea refers to the oyster shell fossils found in this Gevrey-Chambertin vineyard boasting 60 to 90-year-old vines. Similar in fragrance and freshness to the precedent Gevrey-Chambertin, but fleshier and far weightier overall. Fine depth of tangy red berry and cherry flavours mingle with notes of spice, tobacco, and cedar. Firm, yet ripe tannins and subtle cedar, spice define the finish. The Capita bottling is a blend of three Premier Cru sites: En Combottes, En Ergot, and Les Combottes. Seductive ripe black berry and black cherry aromas , with underlying violet, tobacco and cedar nuances. Really vibrant and dense on the palate, with a highly concentrated core leading on to ripe, chewy tannins. Brisk through out, with a lifted finish featuring tangy fruit and cedar hints. This outstanding cru lies in the southern part of Gevrey=Chambertin, on a gentle slope just below the Clos de Bèze. Incredibly elegant, with a delicacy and intense florality that recalls top Chambolle-Musigny. Highly complex on the nose with vibrant red berries, spice, underbrush and cedar underpinning the enticing flowery perfume. It starts quite soft and reticent on the palate but quickly develops an expansive nature that crescendos to a powerful finale with broad, fleshy tannins. Pronounced yet harmonious toasty, vanilla notes from 18 months’ ageing in 50% new French oak frames the lengthy finish. The most famed cru in Gevrey, to which the village paid hommage in 1847 by affixing the word Chambertin to the official town name. Trapet’s 2017 Le Chambertin displays impressive density, concentration and ripeness. The aromatic range seems endless, with red cherry, red plum, crushed raspberry, mocha, exotic spice, tobacco, and gamey nuances all revealing themselves in a well-articulated, harmonious manner. Very firm and weighty on the palate, with brisk acidity, heady fruit and marked, yet fine-grained tannins underscored by finely integrated toasted oak. Incredibly persistent, with lingering hints of leather, tobacco, earth and wet leaf.